John Ferguson was elected To the Dothan City Commission on August 6, 2013. A 1989 graduate of Rehobeth High School, John continued his education at Wallace College, Auburn University, and is a graduate of the University of Alabama - Birmingham. Ferguson is partner and co-founder of Industry Solutions Group, Inc. Founded in 2003, ISG has completed acquisitions of numerous businesses in a variety of industries including commercial printing, sign manufacturing, industrial supply distribution and cellular communications. Commissioner Ferguson is the former Vice President for the board of directors of the Southeast Alabama Child Advocacy Center. As a board member, John was the chair of the Public Relations Committee and served on the Finance and Executive committees. 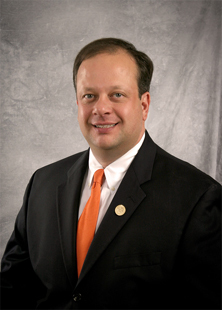 John also serves on the Board of Directors for the Wiregrass Auburn Club and is a past member of the Dothan Planning Commission and the Advisory Board of the Dothan Technology Center. As a city commissioner, Ferguson has served as the commissions appointment on the board of directors of the Southeast Alabama Regional Planning and Development Commission. He also served as the commissions appointment to the board of Directors of the Alabama Municipal Electric Authority and is currently the commissions appointment to the Southeast Wiregrass Area Metropolitan Planning Organization. John is married to Tina Grantham Ferguson and they have two children. The family are active members of Ridgecrest Baptist Church in Dothan. Commissioner Ferguson enjoys an occassional round of golf, college football, water and snow skiing, and traveling with his family.